I am a trailer editor. In practice, that means that what I cut from day to day is mostly TV commercials for movies. There are only so many actual, theatrical trailers that get cut for any given film and there are significantly more TV spots to go around, so that’s what most of us end up doing. In the grand scheme of things, there aren’t really a lot of people and companies that cut this stuff. The competition is friendly, but fierce. Like any business, everyone pretty much knows what the competition is doing, and everyone would be happy to be working on whatever someone else is. A-try it out or even put it in place and see how it worked. B-get mad at the creator of the tool and/or disregard it as useless without really trying it. That tool is FCP X and, up ’til now, the choice that seems to have been made in our little niche, is B. That’s not to say that nobody is using it, there are a lot of people using it quite successfully. Network promos, News, TV shows, Features, Documentaries. . . All being cut on FCP X. So, why isn’t anyone cutting trailers with FCP X? Well, there are some legitimate workflow concerns with FCP X (for now), but that hasn’t stopped companies in other, related niches from deploying it. And yes, it requires some retraining, but that hasn’t stopped some companies in our niche from switching from FCP 7 to Media Composer. I’ve said it before, as far as I can tell the main reason nobody in our business is using FCP X, is that nobody else is. Why do I care? Because I use FCP X. I like it. And I don’t want to have to blindly follow the herd onto some competing NLE. The fact that Adobe Premiere is really similar to the old FCP or that Media Composer has gotten “better” has zero appeal to me. It’s a negative really. What I like about FCP X is that, once learned, pretty much everything I need to do is easier than it is in other NLE’s. Not creatively, that’s the same in any NLE, but technically. I can spend exponentially more time in X just cutting. There are some folks who really like the fact that there are 5 ways to pan an audio channel or 20 preference panes or 30 built in tools most of which you don’t need. I am not one of them. I like simplicity, and that was one of the big appeals of the original FCP. It was just easier to work in compared to the alternatives. And for me, that’s the case with FCP X now. I spend a lot less time manipulating the application, and more time editing. And, it’s fun to cut in. I’m perfectly capable of navigating a complex UI, but if the app I’m in can take care of some of that drudgery for me, it makes me smile. I can spend my time figuring out what to do creatively, rather than how to do something. What follows is mainly directed at folks who cut in FCP “classic”. It also assumes you either have not used FCP X, or have tried it at some point in the past, stared at it in confusion, and given up. Finally, it assumes that you cut “professionally” and know what you’re doing.
. . . you might as well stop now. 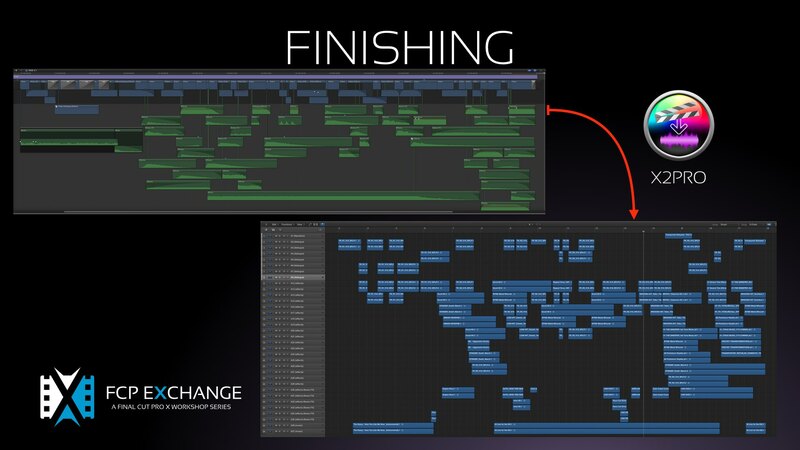 You’re gonna get confused and annoyed, give up, and become part of the FCPX is no good chorus. You can’t just figure it out without help. You know too much. Trust me on this one. This tip brings me to the first thing you need. Tutorials. Macprovideo, Ripple Training, Lynda, YouTube, there are a million of ’em. Get one. Also, get the GEM manuals here. They’re really inexpensive, and really good. Spend a little time to understand the X workflow, especially the project timeline, before you even launch the app. You’ll spend less time swearing at it. 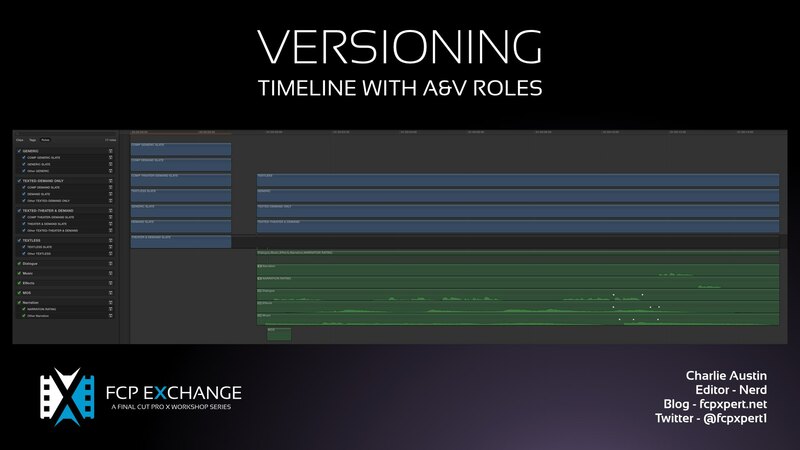 After you’ve gotten a basic understanding of FCP X, Here are a couple other timeline tips/ways of looking at things that might make the transition a little easier. . .
–Forget tracks ever existed. X is clip based. No more patching or track tetris. -The Skimmer will drive you nuts. Use it. Especially Clip skimming. Don’t fight it, it’s really great once you get used to it. –The Magnetic Timeline will drive you nuts. Just go with it, you’ll get used to it too, and figure out how to control it. Then you’ll wonder how you ever cut in a “normal” timeline. –Sync Audio rides with the video, if you have a multichannel source just cut it all in, you can disable/enable the channels later if you need to. If you need to move the audio to cheat dialog or something you can detach it, or expand it in place to edit individual channels. It’s really nice. –Assign Roles to everything as you import it. Video, Dialog, Music, Effects are in the default list, you can make as many as you need. You can do it at any time, but it’s best to assign Roles to Master clips. You can assign Roles to multichannel sources by opening them in a timeline. Proper assignment of Roles is easy, and really important! –Everything sticks to whatever it’s connected to in the Primary Storyline and…. –The Primary Storyline works like Media Composer in ripple mode. Gap, the stuff between noncontiguous clips, is treated like media, even though it isn’t. In some ways, the X timeline is easier to “get” if you have some MC experience. -The Position Tool is your friend. It lets you move stuff around in the primary without Rippling everything. -The tilde key (~) is your friend too. It overrides clip connections when held down. Also, something you won’t find in the manual… If you press ~ and then SHIFT and release the keys, it locks the override until you hit ~ again. Useful! –You can work like FCP 7 if you cut in everything as connected clips. You’ll need to make secondaries or move clips to the Primary if you want to add transitions, but it’s great to be able to rough out chunks as connected clips, and then dump each section into the primary once it’s kind of where you want. Popping in and out of the Primary is kind of like having Media Composer and FCP 7/Pr all in one. –Secondary Storylines are invaluable for things like music beds made from cut up clips that you want to keep together, or may not want to them to move when you move a chunk of video and the clips connected to it. Put these clips in secondaries connected to the Primary at the head of the timeline and they function more or less like tracks used to. -Events are (kinda) the new Bins. I could prattle on forever, but that’s a start. 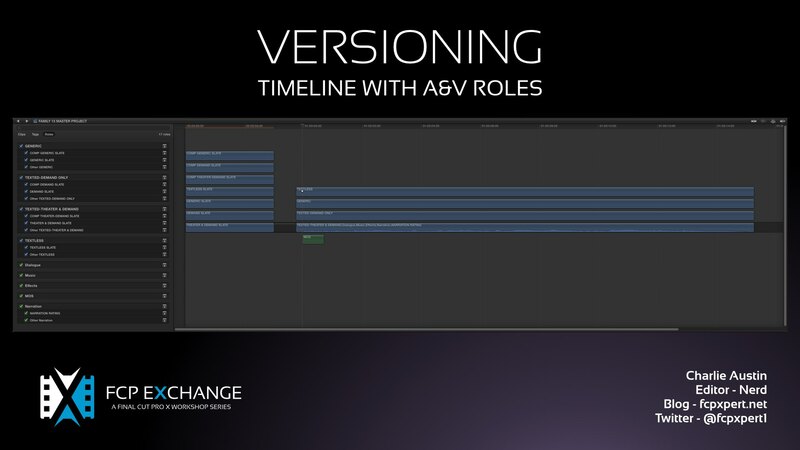 If you need to move back and forth from X to FCP 7 and/or Premiere, you absolutely can. Easily. 7toX is $10, Xto7 is $50. They work really well, so you have a safety net if you need it. 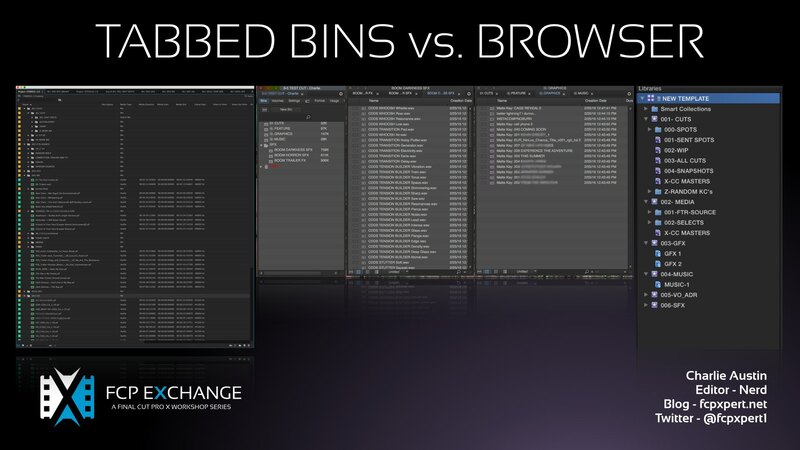 Great to have when you’re just diving in or need to swap stuff with folks on other NLE’s. Getting in and out of MC is do-able, but’s it’s unfortunately a PITA. 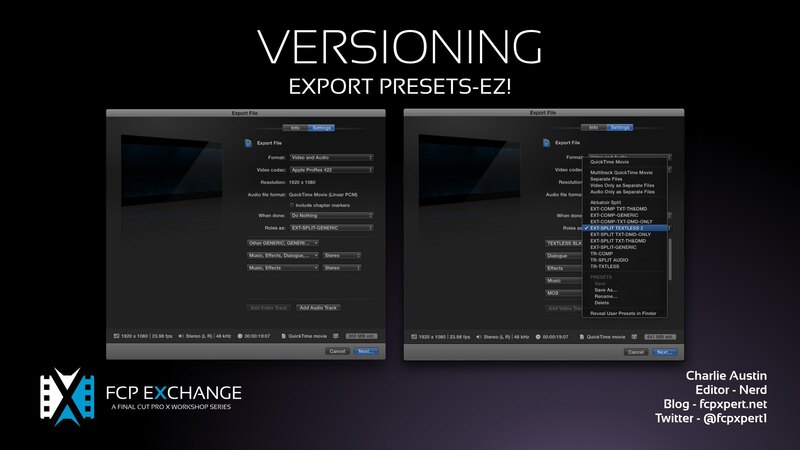 Compressor– $50 – X has a subset of compressor built into it, but for all the random export formats we need, get this. Make presets in compressor, access them from X without switching apps. 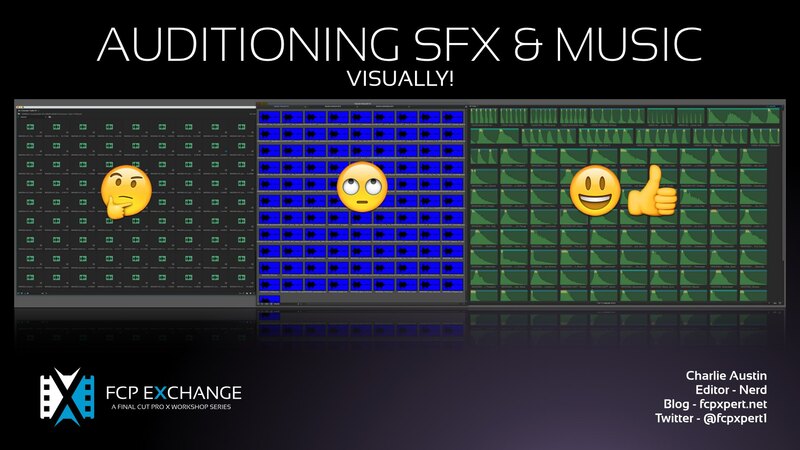 Motion– $50 – Open and tweak 90% of X’s built in effects. Make your own effects, generators and lot’s, lot’s more. Get it. X2Pro – $149 -Makes ProTools (and other DAW) compatible AAF’s. Set your Roles properly and it’ll create a perfectly split out session with 1 or 2 clicks. It’s awesome. EDL-X – $99 – Generates CMX 3600 EDL’s. Also you can edit the source table, and any markers you add to your sequence will show as comments in the EDL. Clip Exporter – Free – delivers your entire timeline to After Effects or batch exports selected clips as Quicktime movies or Nuke files. Resolve Lite – Free – Pretty much the same as the full version but only up to 2k resolution. Get Slice-X with Mocha for $99. In app Planar Tracking. It’s freaking amazing. Save the rest of your $ to put toward this. It’s in Beta testing now but allows for full 3D .obj files and texture maps, up to 8K in size. Sort of like Element3D inside FCP X.
OK, I really will stop now. But that’s just scratching the surface. Google will find you pretty much anything else you can imagine. Have fun….